Much of the commercial downtown district was built in the late 19th century and is now listed on the National Register of Historic Places. Hamburg experienced significant growth in the late 1800s with the arrival of the railroad, including the development of new sawmills, planer mills, cotton gins, a box factory, and a brick factory. The community has experienced steady growth since that time. Today agriculture and the timber industry remain the largest employers. The city of Hamburg recently helped develop and adopted the goals of the Ashley County Heritage Preservation plan. Hamburg’s listing on the Web site for the Arkansas Department of Parks and Tourism now highlights its historic properties and attractions. The city is working with the Hamburg Chamber of Commerce to develop a Web site that includes preservation-related resources and links. 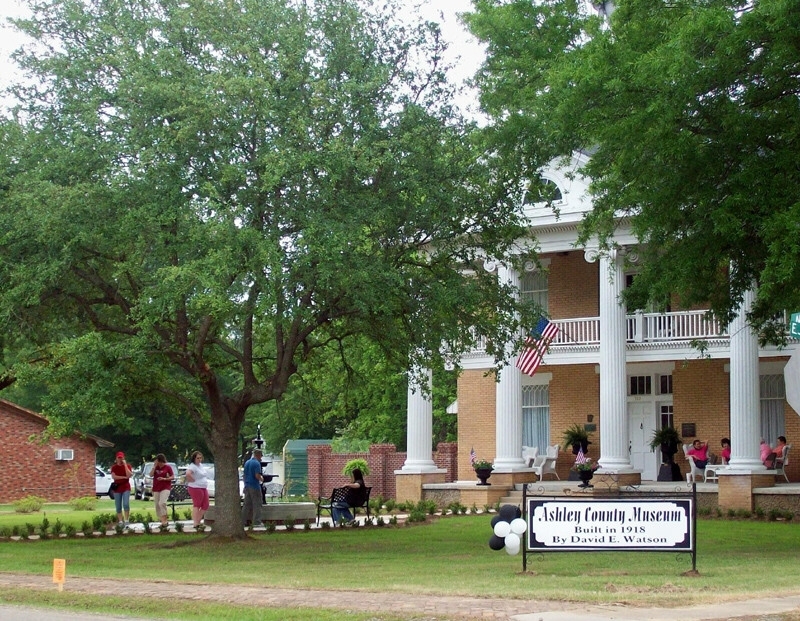 The neo-classical revival David Watson Home, associated with one of the area’s pioneer families, was secured by the Ashley County Historical Society for use as the Ashley County Museum in the 1970s, and has recently been restored. Since then, the award winning museum has participated in one of the Arkansas Historic Preservation Program’s Walk through History tours and hosted an open house for Hamburg’s annual Armadillo Day celebration. Though the festival no longer serves armadillo, this celebration of Hamburg history in the downtown square still includes armadillo races and weigh-ins, tours of the square, museum, and historic churches, shopping, and music. One unusual resource in Hamburg is the Crossroads Fire Tower, erected by the Civilian Conservation Corps in 1935. The City purchased this property in 2000 and, along with the Arkansas Historic Preservation Program, Plum Creek Timber, Ashley-Chicot Electric, Home Depot, and the Forest Fire Lookout Association, made the restoration of the fire tower possible. The tower is now open for an annual open house and by request. EAST Lab (environmental and spatial technology) high school students are heavily involved in community preservation efforts. Among other things, they help maintain exhibits and do archiving work at the museum, maintain an inventory of historic properties in the county, produce and distribute brochures, and are currently helping to restore a roadside park.